The continuing theme for August in Arcadia was hot and dry. Unfortunately as we headed into September, dry turned to drier. Let’s hope driest isn’t next. My little cypress swamp has long since dried up and the cypress trees are turning brown. I think the established ones will survive. The spring planted ones died months ago along with a number of one and two year old longleaf pines and posts oaks that I planted. I’ve also lost two well established oak leaf hydrangeas. My cistern in the back yard is even bone dry. After living in San Antonio for five-plus years I know how to garden in a dry climate. However, I’m not happy at all bouncing back and forth between a “rain forest” and a desert and neither are the existing plants here that are used to 50 inches of rain each year. We did manage to get a sprinkle of rain early in the month that coaxed a few of my brave early Lycoris from the ground. This included the white flowered Lycoris longituba and the pink striped Lycoris x incarnata, two of my favorites. I’ve always loved bulbs that pop magically after the first rains announce the impending arrival of fall. They generally bloom seconds before your gardening spirit is completely broken. I grow about 30 different kinds of Lycoris (spider lilies) which may sound like a bunch until you hear that my friend Tony Avent at Plant Delights Nursery in North Carolina has over 300 different kinds! He’s one of the sources I use for rare new hybrids and recent introductions from their home in Asia. 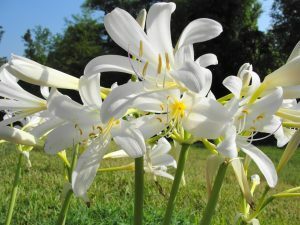 My original collection of special Lycoris came from the late Cleo Barnwell in Shreveport who got them from the late, legendary Lycoris expert and breeder, Sam Caldwell, in Nashville. 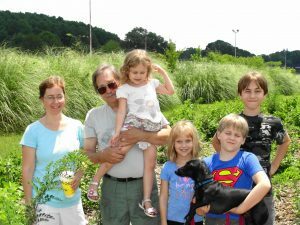 Our SFA Gardens lecture series speaker for August was my old friend, Paul Cox. He’s now retired after many years with the San Antonio Botanic Garden. He literally made the garden what it is today. He brought his whole family along including Larry the Dachshund. We had a great time and I sent a number of plants back with him for my beloved East Texas area at the botanic garden. 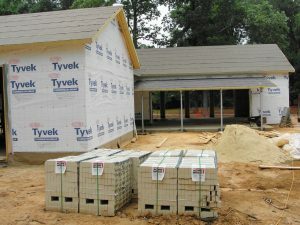 At the SFA Pineywoods Native Plant Center where I work, progress continues on our new Conservation Education Center. Plans are for it to be finished this winter, with a dedication in early 2014. We’ll have to say goodbye this month to recent horticulture graduate Spence Simmons who faithfully filled in for me while I was down with hip replacement. He’s a great kid and a great worker and I wish him the best in the industry. His steady girlfriend Felicia English just graduated in horticulture at SFA as well. She’s also a good kid and will be looking for a job near her sweetheart! I have several new student workers at the PNPC including Arabella Hammons who transferred over from the arboretum. 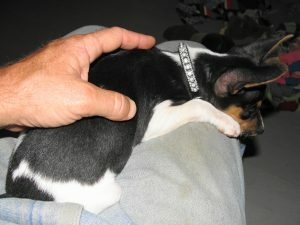 Before she started work she came to me and offered me an eight week old rat terrier puppy named “Business Associate.” She heard I was a terrier person. She and her husband had their hands full with a number of other dogs including pit bulls that Miss Business has been hanging out with. I don’t have to tell you how much I love rat terriers but our long established quota of four critter dogs was already filled in Arcadia. Just in case, I e-mailed my mom (and dog sitter) and said “Can I have her?” “Can I have her?” “Can I have her?!! !” I immediately received a response that included four letter words drifting into a long list of conditions and specification. It didn’t say NO anywhere in the e-mail, so I told Arabella YES, YES, YES! I know at this point you’re beginning to think that I’m not a plant person that loves dogs but a dog person that loves plants instead. This description was once used on a friend of mine. Arabella told me she had been calling the tiny little thing “Busy” but that I could call it what I wanted. I like using flower names so I went with the old fashioned name for balsam, “Busy Lizzie.” Then I got smart and let my mom choose between the two knowing that if she named it she’d grow attached to it! She picked Lizzie, and Lizzie it is. At first grumpy Miss Ilex tried to literally kill the poor little puppy. It took a day of bamboo switches to steer the gal out of her aggressive death march. By the next day she adopted it as her puppy and even started sleeping with it and cleaning it. Ilex does play very rough with her but since Lizzie grew up on the playground with pit bulls it doesn’t seem to faze her. Acer tolerates the new puppy but Mollie and Otie just wish she’d go away. April Jackson, a PhD student from Rutgers University, came to visit SFA to collect specimens of our native sugar maples. She’s studying heat and drought tolerance in the Acer saccharum complex. What better place for that than here! The Southern sugar maples in the forest on my place are leftovers from the last glacial retreat and were once the same species that grows in Canada and Vermont. Over millions of years they evolved to tolerate heat and drought. Northern sugar maples on the other hand won’t survive here. My oldest brother, Doice, turned 53 on August 26 and we all headed to his place on Lake Cherokee in Longview to celebrate. I even took Miss Lizzie. 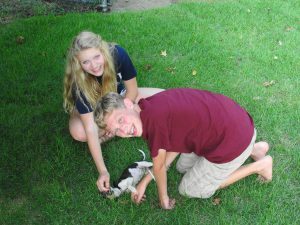 My nephew and niece Levi and Rachel had fun playing with her. My garden is mostly toast and crumbs right now but I have been toying with a simple design for an arbor for the entrance to my crude chicken yard/orchard/rose garden. Hopefully friend and master woodworker Larry Shelton will construct it for me. I will train my new climbing Belinda’s Dream rose on it. The dozer with the rake on it showed up and piled much of the leftover timber debris on my 20 acre longleaf pine project. The next step is to burn the piles, hopefully soon after the current burn ban expires. I’ve had several existing longleaf pines die during the current drought and am a bit leery about planting 20 acres if we are going to continue these annual severe droughts. Longleaf pines are drought tolerant however, once established. CLIMBING Belinda's Dream???? Hey! Now you've got my attention.